Kappabashi was not quite what I expected, ghost-town quiet in comparison to the bustling sea of humans in most other areas of Tokyo that we visited, which was a welcome respite for a crowd avoider like myself. I think it was this gentler pace that made for one of Eve's calmer days, despite being a relatively boring place for a four year old to explore. Despite the serenity and space, I found that Kappabashi was a little less packed with kitchen and cooking related interest than I had built my expectations up for. The store with the Huge Chef head atop was full of cooking goods and gadgets but nothing particularly unique or pretty, this is may be a different experience for people who don't have easy access to kitchen wholesalers where they live. Other stores had plates and bowls spilling out over tables, but were more suited to a commercial kitchen setting up than for someone looking for unique treasures to bring home, which in hindsight makes more sense than what I had built up in my expectations. One store however did not disappoint. Kamata knives is a narrow store filled from floor to ceiling with stunningly made knives, while some reach the high end of the price spectrum compared to buying knives in Australia the prices are a steal for the quality and finish. It's a store I could have and should have gone a little more crazy in, after covering every inch of the store searching for the right purchase I went with a pretty little paring knife. I don't think I have ever owned a knife that is so beautiful to both look at and use. Kappabashi is easily reached via the Tokyo Metro via the Ginza line (not JR so if you have a Japan Rail pass you will need to buy a separate metro ticket or use a SUICA / PASMO pass). For more accurate directions use the Hyperdia app. Stop for lunch at the Moss Burger a few doors down from the chefs head, you'll feel like you're been taken back to 1950s america, except in an alternate universe where America is actually Japan. It's no high end restaurant but it has a pretty gritty charm to it. 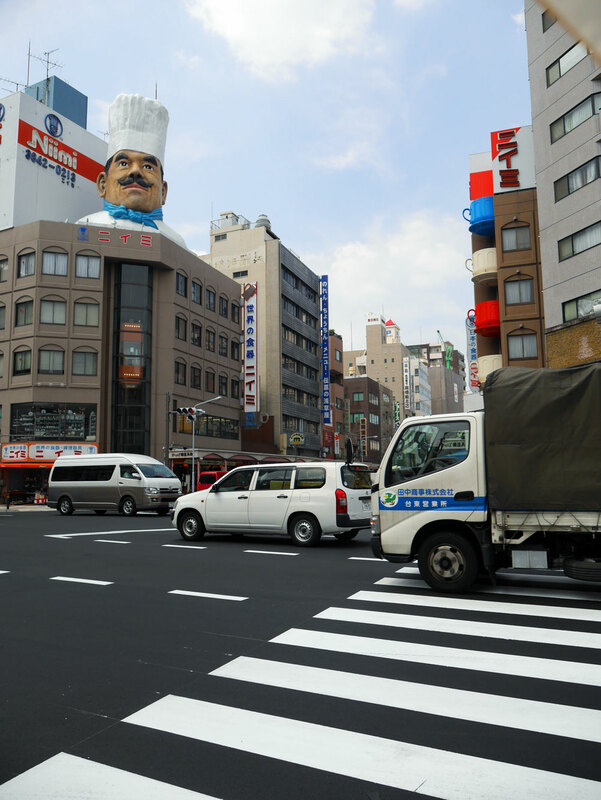 You really only need to allocate a small part of your day to visiting Kappabashi, but it's close to plenty of other interesting Tokyo districts.